I recalled my father-in-law's aphorism "To fool a judge, feign fascination, but to bamboozle the whole court, feign boredom . . . "
I notice he rarely proposes alternatives for the systems he ridicules. "Liberality? Timidity in the rich!" "Socialism? The younger brother of the decrepit despotism, which it wants to succeed" "Conservatives? Adventitious liars, whose doctrine of free will is their greatest deception." What sort of state does he want? "None! The better organized the state, the duller its humanity." Modestly, he explained, "Wars do not combust without warning. They begin as little fires over the horizon. Wars approach. A wise man watches for the smoke, and prepares to vacate the neighborhood . . . My worry is that the next war will be so big, nowhere with a decent restaurant will be left untouched." Was he so sure another war was coming? "Another war is always coming, Robert. They are never properly extinguished. What sparks wars? The will to power, the backbone of human nature. The threat of violence, the fear of violence, or actual violence is the instrument of this dreadful will. You can see the will to power in bedrooms, kitchens, factories, unions, and the borders of states. Listen to this and remember it. The nation-state is merely human nature inflated to monstrous proportions. QED, nations are entities whose laws are written by violence. Thus it ever was, so ever shall it be. War, Robert, is one of humanity's two eternal companions." So, I asked, what was the other? At top, one of John Constable's cloud studies. 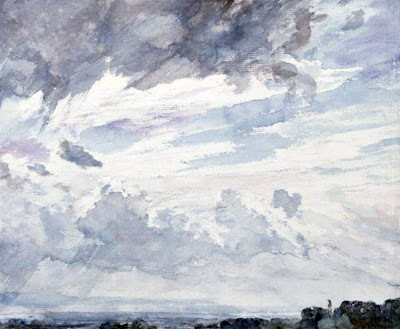 I believe it was Constable who first decided the sky was worthy of being a painting's single focus.